This is my A Lovely Year of Finishes July finish. Since I have a complete inability to have just one goal, I set a primary goal and bonus goals. Okay, so it wasn't done by the 4th of July. But it was done in July. And I'm all set for 4th of July 2015! Moreover this completed project was from a UFO that was many years old and abandoned. I had to make two additional blocks from kits I had and piece it together to make the table runner. 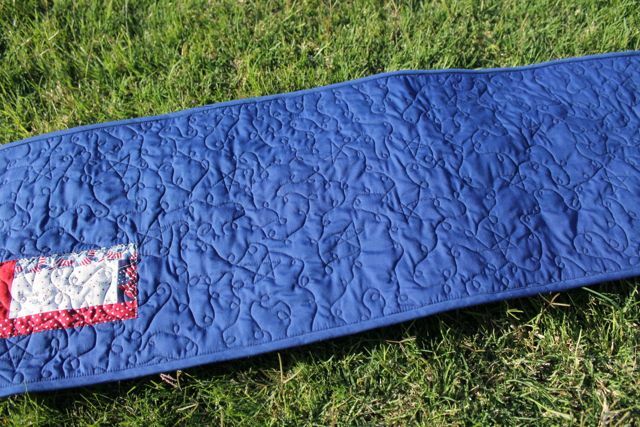 I haven't free motion quilted anything since April, so it was a nice size project to get back to that. And I'm feeling brilliant for saving myself some time by recording the settings on my machine for FMQ so I turned some dials and was ready to go without any trial and error needed. So naming quilts stresses me out. I have quilts named "My First Quilt" and "The Purple Quilt." Yep. Awesome, huh? I decided I'd ask for some help. Me: You know what I'm bad at? I'm bad at naming quilts. Will you help me? The Husband: I don't know what quilts are named. I laugh hysterically. For many minutes. Then I show him examples of other named quilts, Western Kaliedescope and Shattered Rainbow. He points out that he didn't know that quilts were named things like that and then declares, "I think you gave me a crazy task that I had no idea how to do it and I BSed my way out of it." 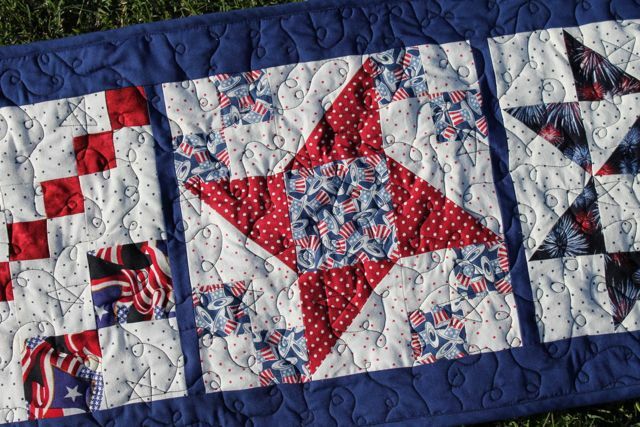 Then a few nights later when I was quilting it, The Husband and I were talking and I said something about it being a 4th of July table runner. "Oh! Then that's perfect, Frieda... like Freedom!" he declared. Um... wasn't that what you were thinking originally. "No, it was just the first name I thought of." More hysterics. By the way, when I showed him the quilt label, he was entertained that I'm actually using the name Frieda. Speaking of the label. I made a cute label using Kelly's Cute and Easy Quilt Labels tutorial. It's awesome. I love it. All my future quilts will have adorable quilt labels. And fun names. For the binding step, I've switched in the past year to machine binding. This was the first time that I used the tube method of making bias binding. I used this binding calculator as a guide. I think the pro of not needing to stitch a million 3 inch bias seams exceeded the con of needing to cut the length of the binding with scissors after stitching. I'm using a 2 1/4" double bias binding... I prefer the look of a 2", but I find that the extra width is helpful for machine attaching the binding. Make party outfits for the kiddos to wear at The Boy's 4th birthday party. Check. The Boy and The Girl were well dressed in their airplane and helicopter attire for the celebration. Create a mug rug (or four) using turned edge machine applique. Ever so slight progress. I cut the fabric for the fronts and backs of these. The applique is intimidating me. Complete step 13 of the mystery quilt. Check. And step 14. And step 15. And step 16. 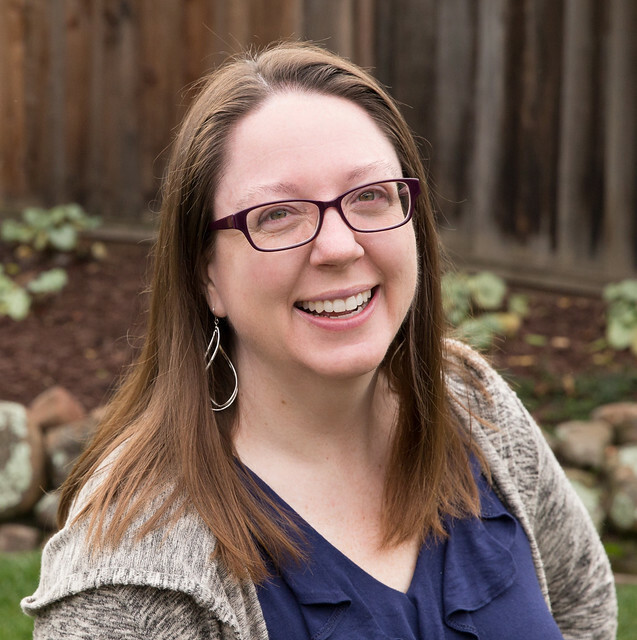 The latest progress on this project can be seen in this post (as well as a peek at a new project). Quilt blocks 3 and 4 from the Building Blocks Quilt Along. Not so much. But I did FMQ some other stuff, so I'm back on the horse, so to say. Wash fabric for use in the Farm to Fabric Challenge. Check. It's washed. Now I need to make haste to make it into a completed quilt that looks vaguely like what I'm picturing in my head. Start visiting quilt shops participating in the Row by Row Experience. Check. Technically, I started. I went to The Intrepid Thread in Milpitas. Their pattern is lovely. Then life got in the way and I haven't been to another participating quilt shop this month. Oops. I have another month to collect rows. We'll see how that goes. Start, finish and mail a block for the Astronomical Quilts! Block Challenge. Check. Start to finish yesterday. I made a Wonky Star Block. I'm linking up on the July ALYoF Finishes Party and to TGIFF at Quokka Quilts. Posted in Quilting. 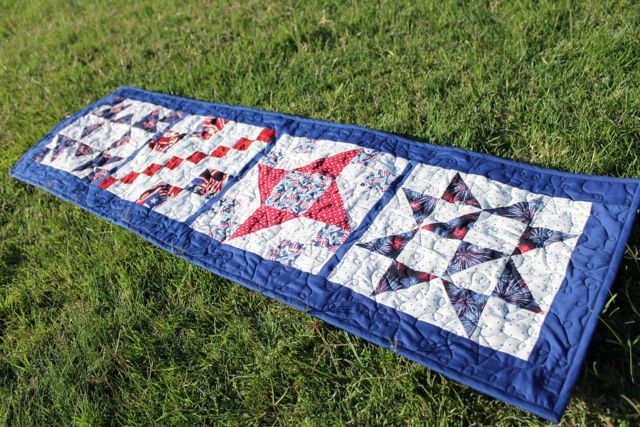 Tags: 4th of July, a finish, table runner on July 31, 2014 by sarah. Congratulations on your finish! I love your label. 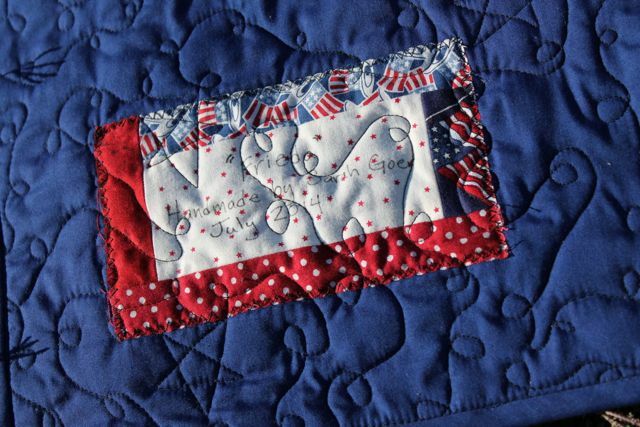 I am notoriously bad with putting labels on so I really love when I see them on other people's quilts! and I love that Freida has little stars quilted on her. Love 'Frieda'! Especially the story behind her name. I too often ask my Husband and Sons to help name my quilts. The latest one my younger (by a single minute, but that still counts, right?) son is "Candyland", my Michael Miller 2014 challenge quilt. But 'Frieda's name trumps that! I'm tired just *reading* about your goals. How do you have the energy to do all this, let alone chase 2 active kids around? As I explained to my mother-in-law, I sew whenever I can, even if it's 12" at a time. I'm pleased to have carved out a space downstairs, because if my sewing machine was upstairs I'd never get to use it. The kids art table is right next to my machine, so if The Girl parks herself to color, or play with stickers, or glue googly eyes to construction paper, I sit down and sew a bit. Oh, the sewing machine is also in view of the dining table, so for breakfasts and lunches if the kids are taking FOREVER to eat, I'll sew a bit then too. Thanks for stopping by! Nice! Congrats on your finish! I like that quilting especially.